Bizarre posts for bizarre people! Currently under a little repair! Since this past year, I’ve been slacking off on watching various shows/movies. Sounds kinda funny considering I’m all about reviewing movies and shows too, right? Needless to say, I’ve been catching up on tons of content I’ve missed for a while; whether that be through video release or the divine gift to the masses that some people refer to as “Netflix”. Among those things was a charming animated dark faerie tale called “Over the Garden Wall.” This mini-series/movie (either works, depending on who you ask) involves two boys lost in a strange otherworld full of anachronistic people, horrible creatures, and some really catchy music numbers. It’s not exactly easy to nail down what Over the Garden Wall is. Is it comical or dramatic? Is it merely an homage to the works of yesteryear or the expectation of tomorrow? Is it a tongue-in-cheek folktale or something right out of The Twilight Zone? And this doesn’t even cover a lot of the mini-series’ countless mysteries that countless fans are still trying to figure out. That combined with the questions above, people are still coming back for more. From a small cult hit to a recognized Emmy winning masterpiece, it’s likely one that will endure for a while yet. But this begs the question, why? Well, I’ll certainly do my best to try to figure it out! NOTE: This review contains heavy spoilers. While this mini-series has been out for almost a year and was recently released on DVD, you have been warned. Sure, reviewing Disney films are a little out of character for me, but I love more than just cheesy horror movies and weird science fiction, ya know? Plus, I’d consider this to be firmly planted in the fantasy genre. Or at least, it’s the magical realism/mundane fantastic that Disney has become well known for. No matter, 2015 marks the return of the big Pixar summer movie once more. While they’ve given anthropomorphic life to bugs, toys, and even the very monsters we dream of, this time Pixar tackles something a little bit different. By that I mean, bringing life to the very metaphysical itself. More specifically, feelings. The story focuses inside of the head of an 11 year old girl named Riley, on the move from some unnamed suburbia in Minnesota to San Francisco. As a departure from what we’re used to, this film is a slice of life with just a hint of Disney fantasy to add a touch of whimsy. Plus, after a lackluster series of trailers (including an upcoming Disney project that looks like it took the safe route), this film was quite the delightful change of pace. It’s Thanksgiving and that means they play the 1930s Classic, “March of the Wooden Soldiers” on television once more! So, let’s take a look back to when I checked out this surreal bit of classic cinema. 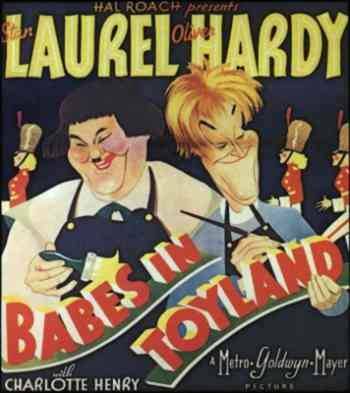 Babes in Toyland, better known as “March of the Wooden Soldiers” was a 1930s Laurel and Hardy film based on Victor Hubert’s work. In terms of today’s audience, it is a truly surreal spectacle for many reasons ahead! Despite that, the goofy antics of our protagonists mixed with the nostalgic atmosphere provides for quite the classic. Now, this star vehicle is perhaps best known nowadays for that weird film that’s played on the morning of Thanksgiving. But, what is it about this film that keeps us coming back? Well, let’s find out! The Doc Speaks: Konami, please stop.